Laser cooling of gases can drop the temperature by as much as 119 degrees Fahrenheit in just seconds, according to researchers at the University of Bonn, Germany. Once the collision is over, the orbits return to their normal shape, and electrons have to absorb energy to stay in the new higher orbit. As electrons soak up extra energy, gas particles slow down and the temperature drops. Star Wars fans are shivering with anticipation at the prospect of real-life freezing options. 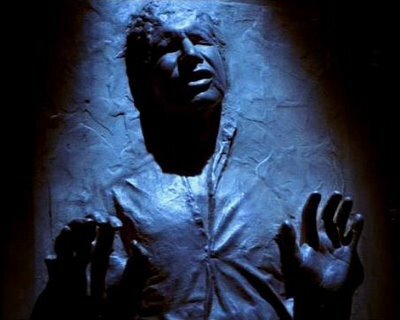 Han Solo was frozen in carbonite; Mr. Freeze was famous for his quick chill. Via Wired. Thanks to Moira for pointing out this story.